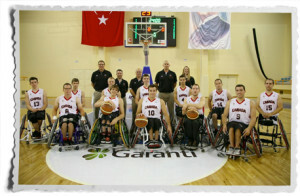 (Adana, Turkey) Canada completes the 2013 World Junior Wheelchair Basketball Championship in sixth place with a 3-5 record following a 67- 38 loss to Iran on Saturday. Canada, who also lost to Iran in their final preliminary round game (83-48), did not match up well against the offensive depth of the Iranian side who for second game in a row had four players reach double digits in scoring, three of which also reached double digits in rebounds. Iran held Canada to a tournament low 25.8% shooting from the field and outrebounded them 52-34. “Nik [Goncin] led the team for seven games and carried the rest of the guys. Today the other guys carried him with everyone playing and nine of the guys hitting the scoresheet,” said Team Canada Head Coach Steve Bialowas. All twelve Canadian players saw at least five minutes of court time with Vincent Dallaire, of Quebec, Que., Liam Hickey, of Saint John’s, NL, and Jack Kosterman, of Fort Langley, B.C., matching a team high six points for Canada, while Nik Goncin, of Regina, Sask., had five points and a team high 12 rebounds and six assists. Jonathan Vermette, of Sherbrooke, Que., and Mitch Bossaer, of Saskatoon, Sask. contributed four points each. Wakeling, of Cambridge, Ont., potted three points in the loss and Philippe Vermette, of Sherbrooke, Que., and Reid Richard, of Tyvan, Sask., rounded out the scoring with two points apiece.